Shinnou was the sensei of Amaru. He came to Amaru's village 15 years ago and after saving her life from a terrible illness, he was welcomed as a member of the village. During which, he revealed to be a former ninja who turned away from the path of battle to help save lives instead. 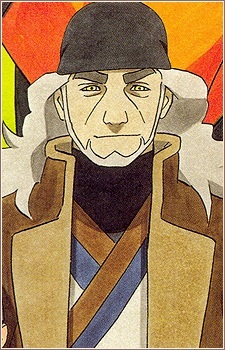 When first introduced he and Amaru came to Konoha to get help for there village when the Sky Ninja appeared. During which, he demonstrated tremendous medical prowess be saving the lives several near-death victims from the Sky Ninja's attack. He and Amaru where then escorted back to their village by Naruto, Sakura, and Hinata. To their horror, when they arrived they found the village in ruins. When Amaru accidentally set of a trap, Shinnou quickly jumped in to save her seemingly at the cost of his own life. Later, he reappeared perfectly fine and revealed he used a special jutsu to create the illusion of death. He also revealed his affilation with the Sky Ninja and that the kind doctor he portrayed for years was nothing but a lie to gain Amaru's trust. He also revealed to have been the one who sealed the horrible Reibi within her to gather as much Dark Chakra from the villagers as possible. He then used the dark chakra to transform into what he called the "Ultimate Body", gaining tremendous physical prowess and the ability to freely manipulate his chakra. Initially, Shinnou repeatedly and effortless demolished Naruto no despite all his attempts, but after Naruto realized Shinnou's power came from Amaru's negative emotions from feeling betrayed, Naruto helped her to let got of her those feelings, stripping Shinnou of his power source and enabling Naruto to defeat him. Unfortunately, before the final blow could be made, Sasuke appeared and intervened as he was ordered by Orochimaru to retrieve the man. Already seeing through Shinnou's power, Sasuke used his Chidori Senbon to disrupt Shinnou's chakra flow, tricking Shinnou to strip himself of all his power and reducing him to a withered old man. Growing desperate, Shinnou retreated to a chamber with the main source of dark chakra. There, he merged with the Reibi's seedling and attempted finish off Naruto and Sasuke once and for one. But once the two unleashed the Nine-Tail's and the Cursed Seal's chakra, they were able to overfeed the cocoon and destroy it along with Shinnou.